11.30 a.m. R1 7 Press My Buttons (4 m Raise the Flag – Ignite, by Yamanin Vital) – Tina Comignaghi (a2); found the line for fifth here on Anzac Day in the Maiden 2100 metres, given Slow7 footing, and contests the $10,000 Maiden 2200 metres. The family generally acts on reasonable ground, so handling heavy conditions is paramount to her chances. Fixed odds: $31.00 & $6.00. 1.09 p.m. R4 9 Captain Risky (3 g Rip Van Winkle – Dreamworks, by Maroof) – Tina Comignaghi (a2); ran a notable race for fifth in the Maiden 1600 metres on 28 April at Hastings, given Dead5 footing, and contests the $10,000 Maiden 3YO 1600 metres. His dam won her only start on heavy ground and the pedigree suggests he may handle it better than most. Fixed odds: $23.00 & $5.50. 3.29 p.m. R8 10 Kane (5 m Darci Brahma – Dream Lass, by Dream Well) – Tina Comignaghi (a2); clocked the fastest last 600m (35.9) on the day, given Dead6 footing, when coming from last to win the Maiden 1600 metres here on 23 March at Avondale, and followed with a very close third on Heavy10 in the Rating 65 1600 metres on 21 April at Pukekohe. 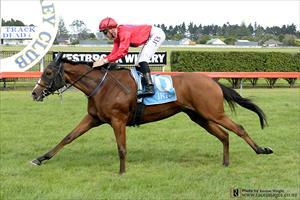 Extremely game, she has the credentials to prove competitive in the $10,000 Rating 65 1600 metres. Fixed odds: $7.00 & $2.30. Tina Comignaghi (28): is a visiting jockey, apprenticed to John & Karen Parsons, in particularly good form this season with 26 wins (including two stakes wins) in a total of 50.